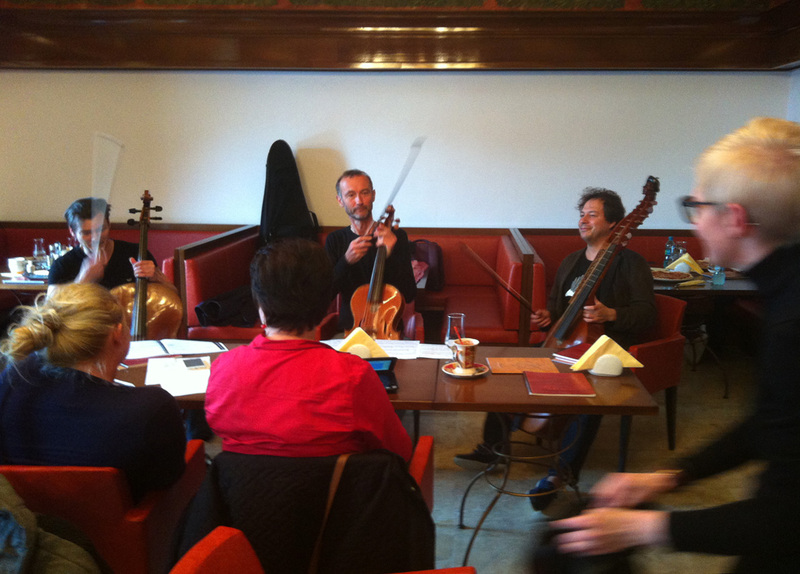 The press conference during The Festival of Old Music in Timisoara 2014 that was organized by the Muzica Antica Society, brought the musicians of the band L’amoroso: Guido Balestracci (baryton a cordes), Bruno Cocset (alto du violon) and Emanuel Jaques (violoncello) to the Stradivarius restaurant, who played a fragment of the concert they hadheld on the same evening at the Evangelic Lutheran Church during The Festival of Old Music for the local media and the present guests. The charm of these instruments, the richness of color and the originality of the invented esthetic solutions made from this event an extraordinary show. The beat of strings presented a deep symbology through music, about the relation between music and spirituality. Diana Emandi – a founding member of the La Follia group presented the history of The Festival of Old Music, a well known festival for music shows/concerts in Timisoara. An exceptional moment took place due to the sound of an original violin from the 17th century, which enchanted the audience in the hands of Emanuel Jaques and enriched the atmosphere, creating an extraordinary event for the opening of the Stradivarius restaurant.